To prevent either forward or backward contamination, spacecraft hardware must be sterilized and evaluated for the presence of microorganisms. The hardware must be maintained in cleanroom environments to control for biological contamination, and environmental contamination such as dust particles and moisture. Special air filtering, personnel garments and personnel disciplines, provide and maintain a specified level of cleanliness. Planetary Protection personnel routinely sample the cleaned hardware to verify its cleanliness and ensure that the level of biological contamination (if any) is within specified requirements. Each exercise, from cleaning the hardware, through to determining the level of contamination and taking action to prevent re-contamination, requires the coordinated participation of a myriad of employees such as hardware engineers, quality assurance engineers, and Planetary Protection engineers. Key documents address procedures and requirements for each aspect of Planetary Protection allowing all project-involved personnel to carry out Planetary Protection Implementation successfully. NASA Headquarters determine specific Planetary Protection requirements for each planned mission, consistent with the NASA Procedural Requirements of NPR 8020.12 (Planetary Protection Provisions for the Robotic Extraterrestrial Missions). The project Manager or Principal Investigator requests PP categorization and mission requirements from NASA Headquarters. PP Category I Missions: no further Planetary Protection requirements, including further documentation, is required. PP Category II Missions: Planetary Protection requirements for this category require documentation only. These documents include the Planetary Protection Plan to detail the planned approach to Planetary Protection requirements compliance, a brief Pre-Launch Report to detail impact avoidance strategies, a brief Post-Launch Report detailing actual trajectory, and End-of-Mission Report for impact location and final disposition of launched hardware. PP Category III Missions: The requirements are generally more involved than PP Category II missions. 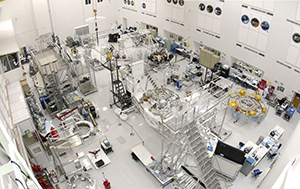 Among documentation for a Planetary Protection Plan, Pre-Launch Report, Post-Launch Report, and End-of-Mission Report, a Planetary Protection Implementation Plan details use of cleanrooms during assembly and testing of spacecraft as well as any microbial reduction measures such as heat microbial reduction. If the probability of impact is considered significant, an inventory of bulk constituent organics is required. PP Category IV Missions: Includes all of PP category III mission requirements above with increased number of implementing procedures to reduce bioburden and prevent cleaned hardware from being re-contaminated (e.g., use of bio-barriers). PP Category V Missions: These are sample return missions to Earth. Both the Earth and Moon must be protected from extraterrestrial contamination. 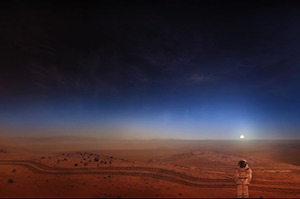 Within this category, missions are classified “unrestricted” if samples are returned from solar system bodies that have no indication of indigenous life forms. Typically, PP requirements from category I and II will suffice. 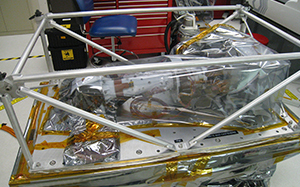 Missions that are classified as “restricted” require PP implementation associated with category IV missions as well as continued monitoring of project activities, studies, and research in the sample-receiving laboratory. Documentation includes the Earth Safety Analysis Plan, which details potential contaminating sources and probability of contamination. The return Implementation Plan describes how the Earth Safety Analysis Plan is to be implemented. An End-of-Mission Report documents the degree to which the mission has met its Planetary Protection requirements through landing and delivery of sample to containment in a Sample Receiving Facility. Finally, a Sample Pre-Release Report verifies that the sample is free of hazard to the Earth’s biosphere and that all biohazard and life detection protocols have been followed. Following categorization, a Planetary Protection Plan documents how a flight project meets its Planetary Protection requirements. The Planetary Protection Implementation Plan then describes how the Planetary Protection Plan is to be implemented. Subsidiary documents such as the Microbial Reduction Plan provides information on how hardware is microbially reduced to a specified level. 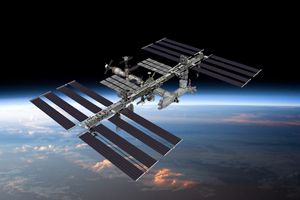 The Biological Contamination Analysis Plan details allocation of the allowable burden to parts of the spacecraft, selection of flight assemblies for microbial reduction, sampling of the flight hardware for the microbiological assays and analysis of the microbiological data from the assays. The Microbiological Assay Plan discusses the sampling technique and procedure (culture) for the enumeration of the spores from the samples, consistent with NASA-HDBK-6022 (NASA Standard Procedures for the Microbiological Examination of Space hardware). A Pre-Launch PP Report documents the degree to which all requirements have been met and must include the values of the microbial burden at launch and organics inventory. 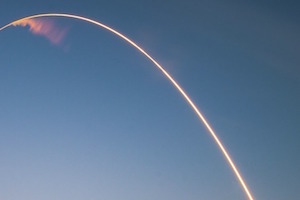 A Post-Launch PP Report details actual trajectory and updated documentation. An End-of-Mission Report provides the impact location for the launched hardware. NPR 8020.12 contains additional details for these and other related documents. Bioburden is the number of microorganisms (including spores) in or on an item of interest. Surface bioburden refers to surfaces whose bioburden may likely reach a planetary environment following a nominal spacecraft landing. Encapsulated (or embedded) bioburden is bioburden that is nestled inside nonmetallic material. The bioburden of the external surfaces of the spacecraft and its subsystems can be controlled by solvent cleaning (wipe, rinse and/or spray), and contamination procedural and facility controls during assembly and testing. Assemblies with large surface areas and those that are difficult to clean or possess limited access are often subject to Heat Microbial Reduction (HMR). This approach significantly reduces the bioburden as per NASA specification. Unfortunately, many thermal sensitive materials and parts cannot be exposed to such high temperatures and require different modes of microbial reduction such as Vapor Hydrogen Peroxide (VHP). This method effectively sterilizes the surface of materials: it has been used in hospitals to eradicate antibiotic resistant microbes. The spacecraft are assembled in clean facilities, with appropriate controls and procedures, to reduce/eliminate presence of environmental pollutants such as dust, airborne microbes, aerosol particles and chemical vapors. Some of the controls and procedures include air conditioning, special air filtering (such as HEPA filtration system), humidity control, electrostatic discharge (ESD) considerations, and personnel garment requirements. If offsite facilities are needed or used, they will also provide the spacecraft with cleanliness environments with appropriate controls and procedures. Cleanrooms are classified according to the number and size of particles permitted per volume of air (https://www.iso.org/obp/ui/#iso:std:iso:14644:-1:ed-2:v1:en). The designated class also dictates the gowning requirements. For example, spacecraft are generally assembled in ISO-8 or better facilities. Typical gowning requirements for this class at JPL include at a minimum: disposable shoe covers, face mask, bouffant head cover, smock and gloves. ISO-7 class facilities at JPL require full gowning or “bunny suit” which requires at a minimum: disposable shoe covers, face mask, bouffant head cover, hood, boots and gloves. Often times the gloves are taped to the cuff of the bunny suit to prevent gloves from sliding beyond the cuff and exposing the skin. 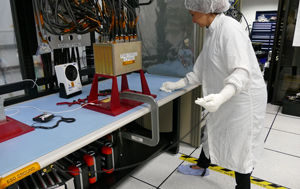 To ensure that spacecraft meet their bioburden requirements as described in the Planetary Protection Implementation Plan, Planetary Protection engineers sample the hardware. Using tools such as a cotton swab or polyester wipe, Planetary Protection personnel recover biological material (e.g., spores) from cleaned hardware (sampling of each exposed surface takes place at the last physical access, just after a cleaning procedure). The samples are processed and analyzed to determine the bioburden. 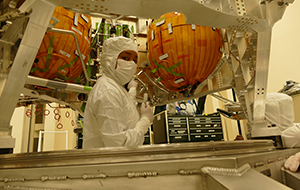 Sampling events typically occur in the cleanrooms (e.g., Spacecraft Assembly Facility) where Planetary Protection engineers follow all of the necessary gowning and safety requirements depending on the ISO class. There is a tight coordination between hardware engineers and Planetary Protection engineers to determine the date and time of sampling, and to discuss any pertinent information for the item to be sampled. In this way, Planetary Protection personnel can prepare all necessary tools and equipment prior to the sampling event. The specific sampling areas must be selected with a view to being representative and without the fore knowledge of the hardware engineers, the hardware integrators, and the cleaning technicians. Similarly, the sample sites should be scattered (not contiguous). Swab or wipe (or both) methods are used for the required sampling of exposed surfaces. The selection of wipe sampling for a particular surface over the default choice of swab sampling is guided by the area of the surface and its suitability for wipe sampling, which requires relatively smooth, flat surfaces. The swab method is utilized for smaller hardware surfaces (less than 1m2) where each swab can sample a surface no greater than 25cm2. Wipe sampling is preferred for any suitable surface at least 0.1 m2 in area. For larger suitable areas (1m2 or more), it is essential. As a standard, 10% of the representative hardware surface area should be sampled. Often, a mixture of wipe and swab sampling is appropriate. During sampling, aseptic technique is used (i.e., sterile gloves, sterile forceps, sterile wipes, sterile swabs, sterile containers, etc.). Sterilization of swabs, wipes, and associated materials and containers is achieved by autoclave (steam under high pressure) for at least 15 minutes at 121°C and 15 psi. 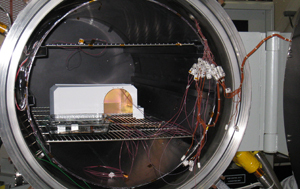 The NASA-HDBK-6022 document describes the microbial examination of space hardware. In this handbook is the detailed information for the NASA Standard Assay that is used for processing the samples collected in cleanrooms. Once samples are acquired (swab, wipe or both), they are suspended in sterile water (for swabs) and buffered solution (for wipes) followed by sonication for 2 minutes to rinse the samples from either swab or wipe. Samples then undergo "heat shock" at 80°C for 15 minutes. Portions of each sample are poured in petri dishes followed by a rich bacterial growth medium such as tryptic soy agar (TSA). The plates are incubated at 32°C for a period of 72 hours and examined at three 24-hour intervals. If spores are present in the sample, colonies will form on the TSA plate. These colonies are counted and recorded in a computer barcode program. At the end of 72 hours, the total number of colonies is used for calculating the bioburden density (number of spores/m2). 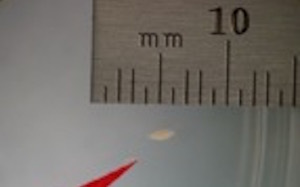 Not all of the sample volume is plated onto TSA plates, thus, the calculation must take into consideration the possible number of spores in the “left-over” volume (pour fraction). The efficiency of either swab or wipe method is also taken into account and is based on independent data. Finally, the area (m2) sampled for each wipe or swab is considered. The bioburden density value is then used to determine if the sampled hardware meets the Planetary Protection bioburden density requirements as documented in the Planetary Protection Plan. If the density exceeds the required limit, re-cleaning may be required followed by re-sampling. Cleanrooms and personnel garmenting requirements are used to prevent recontamination of bioburden on an exposed (burden accountable) surface. Large surface hardware is draped as often as possible. Smaller hardware is double bagged. HEPA filters are also used to prevent recontamination inside hardware.